KHOU’s new set isn’t even one year old — but, thanks to the flooding from Harvey, it’s not being used in the station’s wall to wall coverage of the storm. The set, which debuted November 2016, uses an “in the round” design. Meanwhile, the station’s efforts to stay on the air and continue bringing viewers the latest on the storm and flooding — even as its own building was evacuated, has received national attention. Photos posted to Twitter Sunday, Aug. 27, 2017, show the studio with water on the ground as well as the station’s lobby submerged in water. The station initially moved its broadcasts to an upper floor of the building, creating a makeshift set in what appears to be a conference room. The setup included two anchor positions and a flatscreen used as a background element. 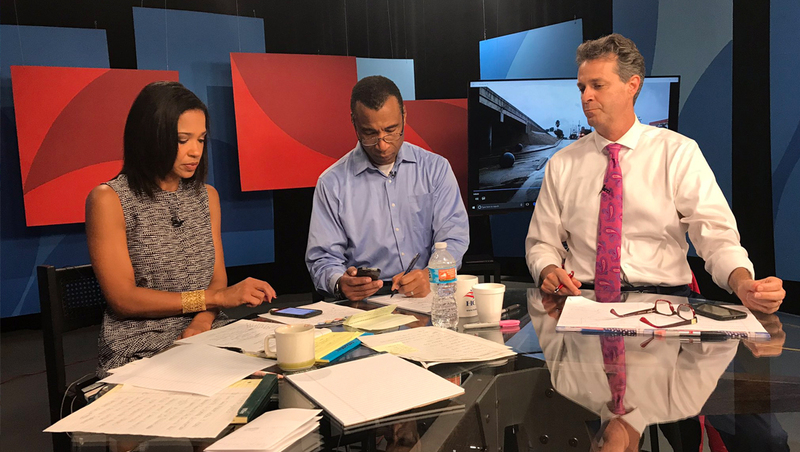 As the flooding worsened, the station was forced to relocate to the studios of KUHT, the market’s PBS affiliate, where a large round table in front of hanging red and blue panels and a flatscreen served as the station’s set. The station’s sister station, WFAA in Dallas, took over master control for the Houston station. Reporter Brandi Smith and photographer Mario Sandoval stayed on the air — live — for about 30 minutes straight while the station scrambled to move equipment and talent to a new setup. WATCH LIVE: Continuing emergency weather coverage on catastrophic flooding from Tropical Storm Harvey. While it’s not clear how much damage the station and set sustained, given that it’s stocked with video walls and other technology as well as laminate surfaces that don’t mix well with water, it’s likely that the damage was significant.